WOW, this home has undergone a total transformation! The stunning renovation in addition to the tranquil lagoon views make this home a perfect choice for relaxation and comfort! 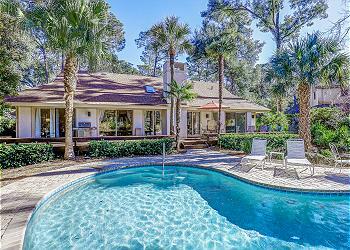 This Palmetto Dunes home offers 4 bedrooms, 4.5 baths, a private *heated pool and spa, and is just a 5-minute walk to the beach. The living room with large flat screen TV, has plenty of seating for the whole family with a wall of windows overlooking the pool area. Brand new wood plank flooring throughout. Adjacent to the living area is the formal dining room with seating for 10 which is open to the impressive gourmet kitchen with marble counter tops, double wall oven, bar sink and large island with seating for 3 in addition to a breakfast nook with seating for 6, sliders lead out to the pool. A king master suite with adjoining full bathroom with a tub/shower combo complete this floor. Up a few steps is a media room with sleeper sofa and flat panel TV. This level also offers 2 bedrooms: a king with private bath and a queen bedroom with private bath which has a walk-in shower. A few more steps lead to another living space and sleeper sofa. This is a perfect spot for the kids to escape! Also located on the this level is a cozy loft space and the magnificent master suite and beautiful en-suite bath with large tub and walk-in shower. •	Private *heated pool and spa (18 x 29 kidney) *This pool & spa have a gas heater and can be heated for an additional fee of $575-$875 + tax per week depending on the season. If you would like to heat the spa only, the cost per week is $225 + tax.